March is here and so it’s our 2nd edition of The Night Starts Here that happens on March 9th at STPLN, in Malmö. On stage we proudly present The Guide together with Stina Künstlicher. So, bring your own beer and join us for some sweet music and chill hang out with your friends. But this time, we’re taking it to the core: only YOU can make this concert happen! 20 tickets HAVE to be sold by next Tuesday (March 6th), otherwise, there will be no concert. So come on, support The Guide and Stina Künstlicher now by getting tickets. They wanna play! We are very happy to tell you that several new awesome bands have joined Emues. A big welcome to Crying Day Care Choir, Funked Up, Le Shake Before Use, Shotgun Crackers and Sonja Skibdahl. Do you want to see any of them play at a venue near you? Easy: sign in, suggest a concert, spread the word and enjoy a concert with your favorite band live on stage. Some of the bands registered on Emues are keeping themselves very busy. Fredrik was touring in California, Woodstripe just got back in Sweden from touring in San Francisco. Skilla did 3 gigs in a row for Schools. It looks like they had a blast! This is Head, MF/MB and Turn off your television are in the studio recording new albums. We’re looking forward to get a sneak peek on the upcoming songs… All the best and good luck to you guys! Rumor has it that Frantic Sunday might play in Malmö this Spring, following their new album release. 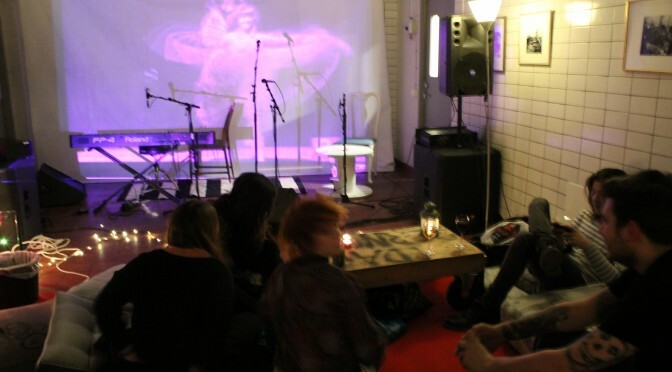 We also heard that they are Uppsala most amazing live band… What do you think? We’re looking forward to all the great music coming up in March! It’s a wrap: by:larm 2012 is over! Knut Aafløy interviewing legendary music producer John Leckie. 3 amazing full days of great music seminars and amazing Scandinavian bands performing in the hype venues in Oslo. We met interesting people from all over the world brought together by Music. And Music is what we love! 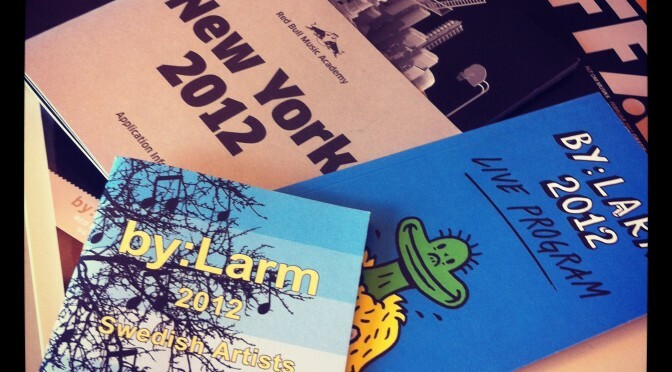 So less words and more sound: we put together a Best of by:larm 2012 playlist for you to enjoy! Did you hear about Emues on by:larm and want to talk to us? The Night Started @ STPLN! The crowd at The Night Starts Here @ STPLN! 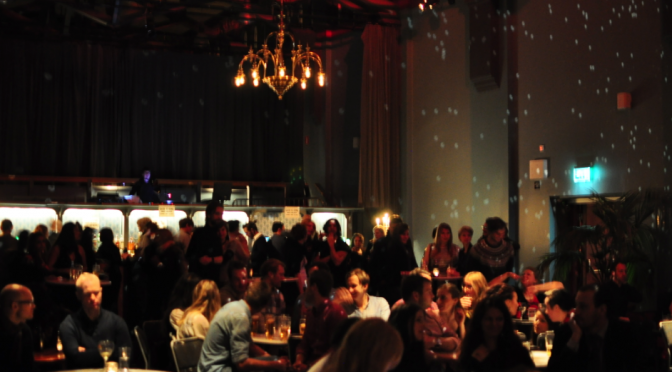 And what a great night it was: tables, couches and candles were in place to set a cozy atmosphere to all who came to enjoy good music and kick off their pre-party with us this last Friday here in Malmö. They came in with their own drinks and gathered with friends to the sound of Andrea Arvidsson (Doc Lounge/Gaffa/Rockfoto) and Elisabeth Östin (Psychedelic Flu), who welcomed everybody with the most inspiring female voices on folk-rock, pop and punk! First on stage was Rovi, dressed in red, behind her keyboard, singing her beautiful songs along with Mattis, who would perform next. It was a warming and intimate performance, getting the audience to dive into her lyrics and melody along with her. Mattis took on the stage next and we could all feel her strong presence: she sang and entertained the audience with good music and good stories, which she shared in between her songs. She got everybody laughing and engaged during her whole performance! Linnea Jonsson was closing the night with her magic guitar and voice. Beautiful songs empowered with her acoustic guitar solos that got everybody dreaming away. The crew at STPLN were amazing, thinking through each detail to make the night just perfect! We’d like to thank everybody involved. We’re looking forward for the upcoming editions of The Night Starts Here at STPLN. Remember: It’s up to YOU to make it happen! You can login on Emues and suggest the bands you wanna see performing in the upcoming dates at STPLN!
! The idea is very simple: you bring your own food and drinks, come by with a few friends at 20:00 to listen to great music in a cozy atmosphere. Andrea Arvidsson (Doc Lounge / Gaffa / Rockfoto) and Elisabeth Östin (Psychedelic Flu) set the mood with the most inspiring female voices of folk rock, pop and punk scene. 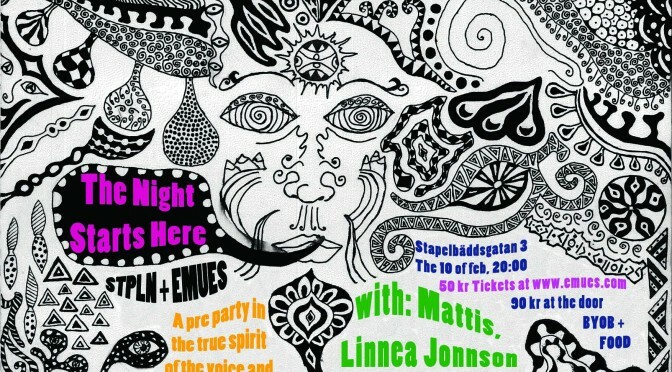 On stage, you’ll see the performance of 3 amazing Swedish singer songwriters: Rovi, Mattis and Linnea Jonsson. Get the tickets now on emues.com! 6 Bands, 1 night: Malmö is a fun city! Friday, 2012.01.27: 6 bands got together for a great music evening here in Malmö. Jihad Dawod, with his vibrant arabic beats, opened the night hosted by the always shiny Suuz. Pelle Hanspers got his band together to perform his latest songs and kept the audience wishing for more. Long Long Showers shook the stage with their fun pop-rock and screaming girls on the front row! Nikita Nox took on the stage: a beautiful outfit, her voice and her dancing moves matched perfectly with the night atmosphere… And before heading on their tour to California, Fredrik invited us to their amazingly crafted sonic landscape that they are now bringing across the Atlantic Ocean: amazing! Åbäke closed the night with a great concert and set the tone with the right beats on the dancefloor. It was a fantastic evening! The venue. Moriskan Paviljongen, was the perfect setting for this event: great stage, amazing staff, all in place to give the crowd a great concert experience! ALL the money will be donated to youth initiatives from Lindängen, Holma, Seved and Rosengård. We’re looking forward to see what projects will come up from that! For now, make sure to check our Flickr profile to see more photos of the event Malmö Sounds Better Together. 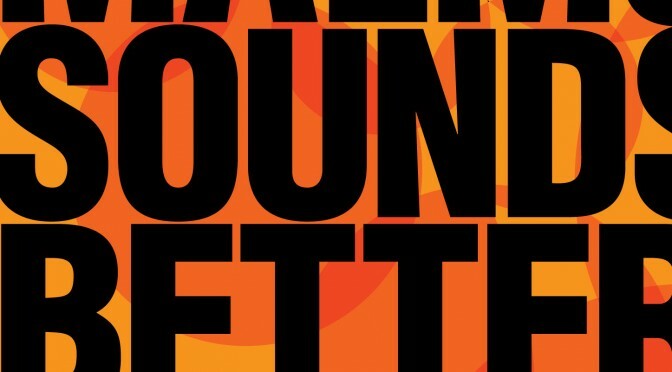 On January 27th, the artists: Fredrik, Nikita Nox, Long Long Showers, Pelle Hanspers, Jihad Dawod and Åbäke are getting together for a great event, called Malmö Sounds Better Together! Not only you’ll get the chance to listen to great music, dance the whole night, but the ticket you purchase will support youth initiatives from Holma, Seved, Lindängen and Rosengård, in Malmö, Sweden. If you are going let us know by tweeting or emailing Several great bands and folks are heading to Oslo in February to attend the super great conference and fest BY:LARM. 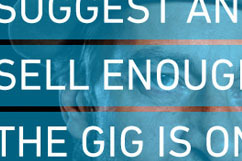 Meanwhile, check out BY:LARM on the web. So much has happened in the Music industry in 2011. It was a great year for music! Digital sales broke records, Spotify took over USA, great bands went touring, amazing Music Festivals. And more than ever, we’re ready for all that again and more in 2012. Emues closed 2011 with a fun Turn off Your Television gig at Medea, here in Malmö. We just love those guys! Did you hear their latest single? We can’t wait to listen to their new album. We also met up with Pelle Hanspers, who gave us some insights about new music coming up this year. For now, you can check his latest album on Spotify or come see him live at Malmö Sounds Better Together, this 27th of January. Exciting stuff, we’re looking forward to see him live! And during the end of 2011 our team grew, as well. Now we got some great people to keep the engines running! Most of the bands registered on Emues have released new music in 2011! We made a selection with the best songs of 2011: It’s a great playlist, so make sure to check it out and give us your feedback and suggestions! Are you missing any track here? We’d like to welcome you back into Emues this year. More bands are getting registered on the website and venues, which means that you have even more options now to suggest the concerts you want! Make it happen! DO YOU LOVE LIVE MUSIC JUST LIKE WE DO?